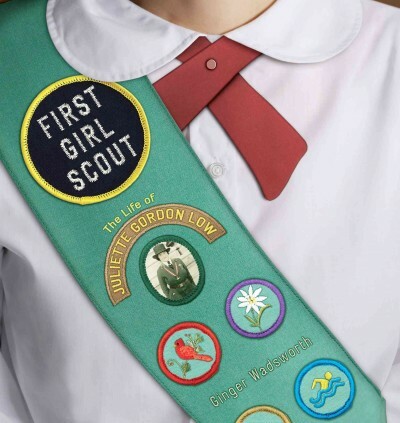 First Girl Scout: The Life of Juliette Gordon Low by Ginger Wadsworth. Clarion Books, 2012. Currently Available. Face Value: Ugh. Another headless girl. However, I am a fan of the traditional Girl Scout uniform and the way that the uniform elements were used throughout the book – chapter titles were printed as embroidered badges, the trefoil adorned title pages, and fabrics used in uniforms throughout the years were featured as page backgrounds. So although the cover is not ideal, the overall book design is aesthetically pleasing. Does it break the slate? Yes, it does. This biography is about a powerhouse of a woman. Juliette Gordon Low managed to generate interest, recruit volunteers, and enroll thousands of young women in the Girl Scouts organization. And although she didn’t do it all herself, it was her passion and advocacy for the organization that kept it going. Her spirit is an admirably Slatebreaking example for any girl who wants to get people interested in something she is passionate about. Who would we give it to? This is an awesome gift book for current and former Girl Scouts. It would also be a great book for anyone you know who is a Girl Scout troop leader. Review: The trouble with reading biographies is that you might find out something disappointing about a person you admire. This was, unfortunately, my experience with reading First Girl Scout. Although I now have much better understanding of Juliette Gordon Low’s life and the origin of the Girl Scouts, there were details that tarnished my imagined idea of what she would have been like. None of those details are the fault of the author. Ginger Wadsworth has done a really nice job with this biography. Published to coincide with the 100th anniversary of Girl Scouts of the USA, this book shows just how impressive a woman it took to found the Girl Scout movement a century ago. It is engaging and shows the breadth of experience that made Juliette Gordon Low (aka Daisy) into the woman who created the Girl Scouts. Daisy was a strong woman because she had been through some emotionally painful times, and her perseverance brought her out of those tough spots. Wadsworth doesn’t gloss over the less pleasant details of Daisy’s life. She writes about her failed marriage, her family troubles, and her struggles with infertility in a way that is appropriate for young readers, yet never conceals the darker parts of Daisy’s story. I am grateful when biographers who write for young audiences acknowledge that younger readers deserve to know about the tough stuff that influences the lives of famous people. I have known a few basic details about Juliette Gordon Low since I was a Daisy Girl Scout. I started in Girl Scouts when I was 5, continued on until graduating from high school, and am currently a lifetime member of the organization. My experience in Girl Scouts shaped me into the woman I am today. In Girl Scouts, I had my first meaningful experiences interacting with girls from different cultural backgrounds. It opened my mind and pushed me to think about the possibilities for life outside of my mostly Caucasian small town. Everyone in Girl Scouts learns about Juliette Gordon Low as the founder of the organization. I remembered that she had hearing impairment and used an ear trumpet, because at a troop meeting when I was little we practiced using ear trumpets just like Daisy did. We talked about Daisy as a role model of an independent woman, and we admired her as the person who started this fine organization. But we never talked about her privileged background and how that allowed her to accomplish the founding of Girl Scouts in the United States. Of course this is naïve of me, but somehow in my head I had painted a mental picture of Juliette Gordon Low rising up from a challenged, impoverished background to travel the world, meet the founder of the Boy Scouts, and then start her own version of the organization for girls in the US. I learned from First Girl Scout that this was not the case. Daisy grew up in a world of immense wealth and privilege. She married a millionaire, and was able to travel between the US and Europe frequently. Her wealth allowed her to travel and associate with interesting people all over the world. It was through these travels that she learned about the Boy Scouts and the Girl Guides and got the idea to start Girl Scouting in the US. Daisy is no less of a Slatebreaker for being a wealthy socialite. She still had an amazing personality that enabled her to get people from all walks of life involved in Girl Scouts. Yet I was a bit disappointed to learn that the Girl Scouts was essentially founded by a bored rich woman who was seeking meaning in her life. I was hoping for a rags-to-riches story, and I didn’t get one. Daisy tended to jump from hobby to hobby, but once she got involved with Girl Scouts, she stuck with it until the day she died. And I can still admire that Daisy was adamant about opening the organization to girls of all social classes, rather than limiting to the debutantes who travelled in Daisy’s social circle. First Girl Scout is a valuable story of a woman who didn’t find a cause until later in life – but once she found it, she advocated for that cause with all of her energy and financial resources. Readers who are less naïve and idealistic than I will certainly enjoy learning the details of her amazing life. This entry was posted in Middle Grade, Nonfiction, Reviews and tagged Biography, Girl Scouts, Juliette Gordon Low, scouting. Bookmark the permalink.